Which is the best dogsled tour in Norway for you? Why go dog sledding in Norway? Norway is world-famous for its breathtaking mountain landscapes, and choosing Norway for your dog sledding holiday can be a wonderful way to combine the adventure of a husky tour with the splendour of the Norwegian landscape. The majestic mountain peaks of central Norway and the rolling fjells of Trøndelag are easily accessible from Oslo or Trondheim, meaning travelling to stunning dog sledding locations can be easier and lower cost than tours further north. In the far north of Norway, the tundra region of Finnmark offers a very different landscape - wide, open spaces of wilderness with a magical atmosphere. For the truly adventurous, set your compass towards the North Pole and journey to Svalbard, one of the most northerly settlements in the world, and a treeless wilderness of glacial valleys and imposing mountains and the location of one of our most challenging dogsled tours. Norway offers world-class landscapes for a dogsled adventure. Photo: Nature Travels. Who should choose this tour? You are an adult solo traveller, group or family with older children (min. age 13) looking for a moderately challenging and unique dogsled experience. Three tour options are available: a 5-day tour with 3 days' sledding, an 8-day itinerary with 3 days' sledding and additional activities at the kennels, and an 8-day itinerary with 6 days' sledding. You appreciate a strong focus on tradition and sustainable living. The cabins at the kennels, where you stay for the first and last nights of the tour (and also additional nights for one of the 8-day itineraries) have not only been hand-built but are also completely furnished and decorated with hand-crafted items from local materials. Even the clothes you will be wearing when sledding are hand-made! The handcrafted cabins at the kennels are a unique attraction for this tour. Photo: EH. 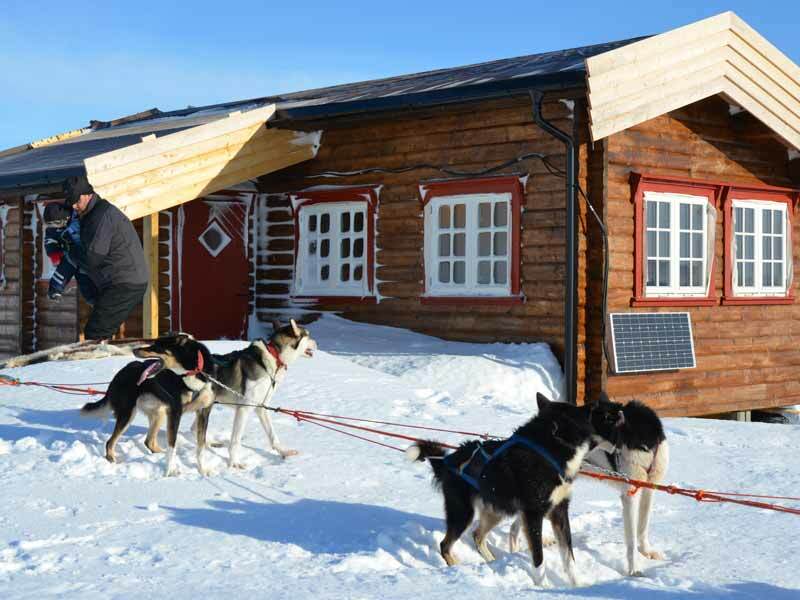 Located in the far north of mainland Norway, these tours offer the possibility to sled on the Finnmark plateau and are a perfect choice for dog sledding in a remote and beautiful wilderness area but with a level of challenge accessible to most guests with general good level of fitness. There is the flexibility to use tandem sleds where both persons drive at the same time, progressing to driving own sled as you gain confidence and experience. 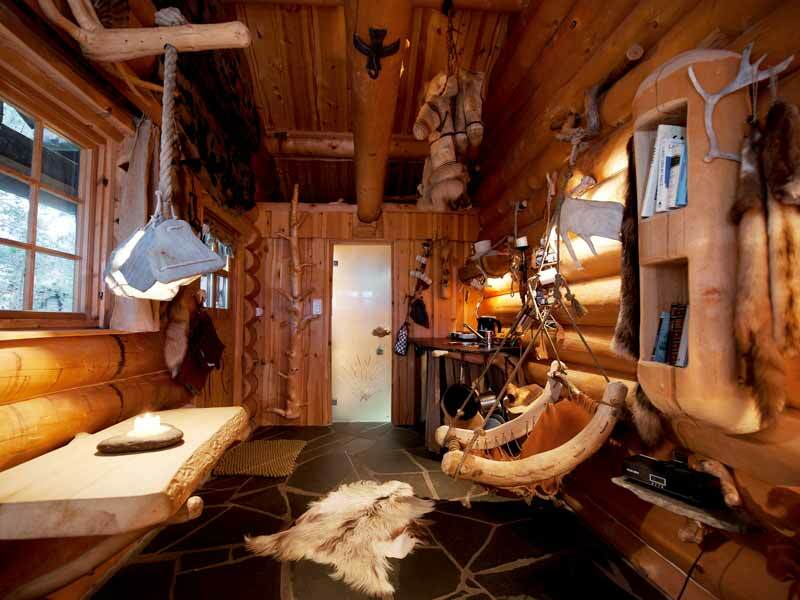 When out "on tour", accommodation is in simple wilderness cabins as for other dogsled experiences. For the 8-day itineraries, there is also a Sámi cultural element where you have the opportunity to visit a local family and learn something of the life of a reindeer herder. Nearby Karasjok if the home of the Sámi parliament and a centre for indigenous political administration. Solo adults or small groups (max. 3 persons) with previous outdoor experience seeking a challenging wilderness expedition with winter camping in a uniquely remote and untouched region. Those looking to travel later in the winter season - these tours run only in April and May - and experience the very special feeling of dog sledding in 24-hour daylight! Where else but Svalbard can you dogsled in a landscape like this? Photo: T. Simonsen. Due to its extreme isolation and the exposed nature of the terrain, Svalbard offers possibilities for Norway dog sledding adventures no other location can. This is a winter camping tour taking place during the period of the Midnight Sun, when there is daylight 24 hours a day. Beginning and ending with nights in simple accommodation at the kennels, the tour features 5 days' sledding on an expedition into the wilderness, winter camping each night. With very small group sizes (just max. 3 persons per tour) and only a few departures each year, this is an exclusive dogsled experience you will remember for a lifetime. Solo adults, small groups of families with older children (min. age 14) who would like adventurous sledding in breathtaking mountain scenery but with easy access from Oslo (the kennels are just 4 hours by direct bus from Oslo, making this our easiest dogsled tour to travel to). Those wishing to combine their dogsled tour with other activities. Beitostølen, where the tours begin, offers a number of options for winter activities before or after your tour. Enjoy a husky hug and beautiful scenery at the same time! Photo: BH. The Jotunheimen mountains are one of the jewels in the crown of Norway's stunning nature. While you're too far south for Northern Lights here, the scenery will more than compensate. With flexible tour durations of 2-5 days, these dogsled tours span a wide range of challenge levels, with the shorter tours accessible to a wide range of guests and longer tours being challenging adventures. In all cases, the beautiful mountains of Jotunheimen and Langsua National Park offer the opportunity for world-class dog sledding. The tours are based on using tandem sleds, where both persons drive at the same time (though solo sleds area also available), making it much easier to work with the dogsled teams in this challenging mountain environment. Despite its southerly location, the area has a very long winter season, with conditions for dog sledding typically suitable well into May. Solo adults, small groups of families with older children (min. age 15) who would like a relatively short tour easily accessible from Trondheim, but which offers a real flavour of mountain dog sledding. Female travellers who would like a ladies-only tour (there are mixed and female-only tour dates available). The night in wilderness cabin in the mountains is a great introduction to longer cabin tours. Photo: NHA. Just an hour from Trondheim, this tour combines accommodation in comfortable chalet with (for the Open and 5-day tour itineraries) a night in wilderness cabin in the mountains.